Average Weight	: 50 - 75 lbs. The exact origin of the Collie is unknown, but it was descended from generations of hard-working herding dogs. For centuries the rough-coated Collie was hardly known outside Scotland. Early rough Collies were smaller, with broader heads and shorter muzzles. The dogs were used for water rescue, herders, guiding cows and sheep to market and for guarding the flock in Scotland and England. The breed's name probably comes from its charge; the Scottish black-faced sheep called the Colley. In the 1860s Queen Victoria kept Collies at Balmoral Castle in Scotland, making the dogs very popular. J.P. Morgan, along with other wealthy people, has owned Collies. In the late 1800s the Collie was mixed with the Borzoi, and all show dogs had to have the Borzoi blood for them to win in the show ring. The working dogs separated, branched out and became the different breeds (with the Scotch Collie remaining) and the show type became what we see now, the large dogs with flatter faces. The rough Collie is much more popular than the smooth Collie. The smooth Collie is more popular in Great Britain than it is in the United States, but is gaining some popularity in the States. The smooth Collie is the same as the rough Collie, but without the long coat. The AKC considers the rough and smooth Collies as variations on the same breed and they are judged by the same standard with the exception of the coat. The first Collie was presented at a dog show in 1860. The Collie was recognized by the AKC in 1885. 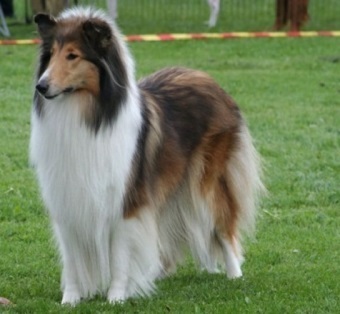 The Collie is well known for its role in the movie "Lassie," featuring a rough-coated Collie as the main character. Collies are very polite, quick, and sharp minded dogs with a sweet temperament. It is quite easy to train these dogs as they are smart and have great grasping power. They can serve as outstanding herding dogs and family pet. Due to their friendly nature, they get along with other animals very well. They are possessive, caring, and very defensive of people whom he/ she love. This breed is completely devoted to his/her master. Besides being an amazing family pet, Collies also makes a wonderful companion of children. This is a gentle, obedient pet that simply loves to play around especially with children. They like playing games such as tug of war, hide and seek. Collies are highly sensitive dogs. If at any point of time they have done something wrong then they should not be shown rude behavior by their master. What is required at that time is, to show them what they were supposed to do and they will understand. These dogs are very social and love to be surrounded with people or with other animals. They shouldn't be left alone, as they get bored easily. Collies require proper time and attention of their master. These dogs become very happy and lively when they get proper care and attention of their master. Collies are generally very cautious of strangers. These dogs love to bark at strangers who look suspicious and can behave violently at certain situations. They are always alert of everything happening around in their environment. Sometimes, they can bark too much making the situation uncomfortable so they should be trained to bark less. PRA (progressive retinal atrophy), which means a stage where the cells of the retina, starts dying at a faster rate. PRA occurs to those collies who are suffering from genetic disorders. If not treated upon then it can lead to loss of vision. Collie nose, that is why collies nose tip is very sensitive to sun. Besides all these, they can also suffer from hip dysplasia which can lead to arthritis. The rough collies, which have hard coat, need extra attention and care as compared to smooth collies. Their coat shed mud and filth quite often so they need through cleaning and brushing weekly to keep them look good and healthy. Smooth collies are on the other hand easy to groom though they also need to be brushed and bathed. These can be brushed in the time period of one to two weeks. Collies shed greatly almost twice a year. People who want to have Collies but don't want much grooming, they should go for Smooth Collies, which doesn't require much grooming due to their short and smooth coat. Collies needs frequent exercise otherwise he/she will become lazy. They should be taken to long walks daily to cheer them up. Collies are very agile and easy to train dogs. They demand proper training full of activity and challenges. These dogs need a physical workout of about 60-80 minutes per day. They don't like repetitions in method of training as they become bore easily due to which they can turn lethargic. So Collies need interesting and motivating review sessions, which can force them to utilize their energy and skill. So, if you are having a Collie or Desire to have one then you have to be very patient and friendly with proper time and attention required for Collies. And if you have children, then it can serve as an added advantage as Collies love to be in company of Children. Take very good care of your Collie who just want love in return of love.